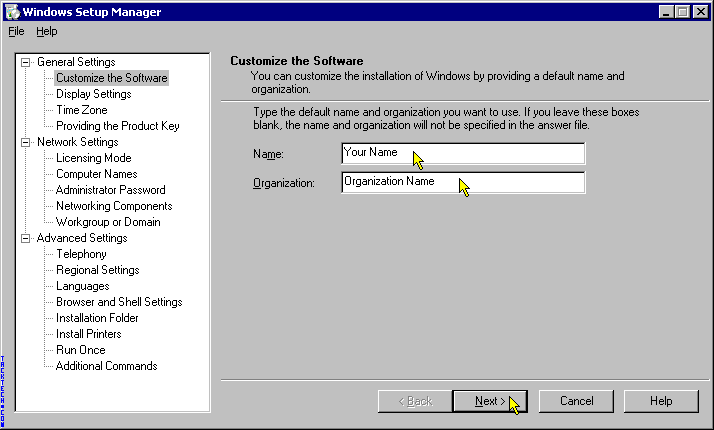 Creating an unattended installation of Windows 2000/XP/.NET (Part 1) (Windows 2000/XP/.NET) - TACKtech Corp. This is Part 1 of Creating an unattended installation of Windows 2000/XP/.NET. A list of things you will need. Note: Yellow Cursor is options we used, blue is alternative options that you can use. Note 2: You can read the /Support/Tools/Deploy.cab/ref.chm for all documented options in the unattended file you create. 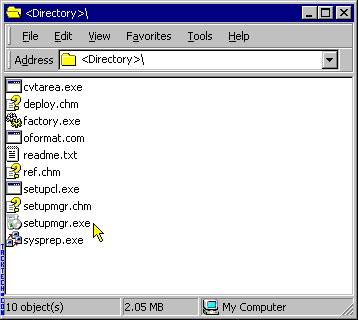 First thing you need to do is run the setupmgr.exe file from the deploy.cab file. Next we start the wizard. This step allows you to create a new unattended file or edit an old one. Click Next. Select the Windows Unattended Installation. Click Next. Select the Windows version of your choice. 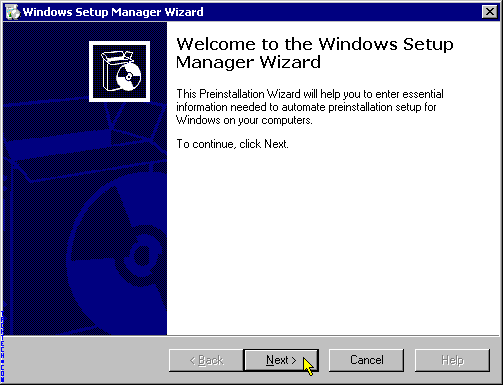 (Note: The Windows 2000 version will also work for Windows Professional). Select Fully Automated. Click Next. 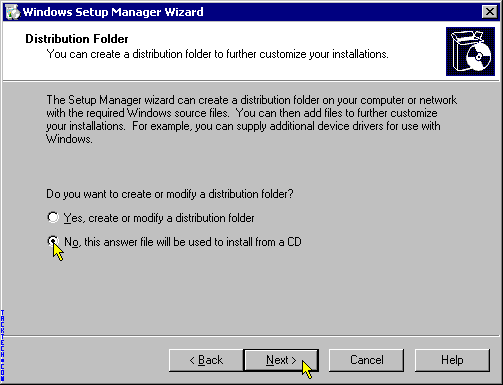 The next screen you can choose to have a distribution directory which isn't too use full but the option is there. We do not in this example. Click Next. Agree to the EULA. Click Next. Enter your User Name and Organization. Click Next. 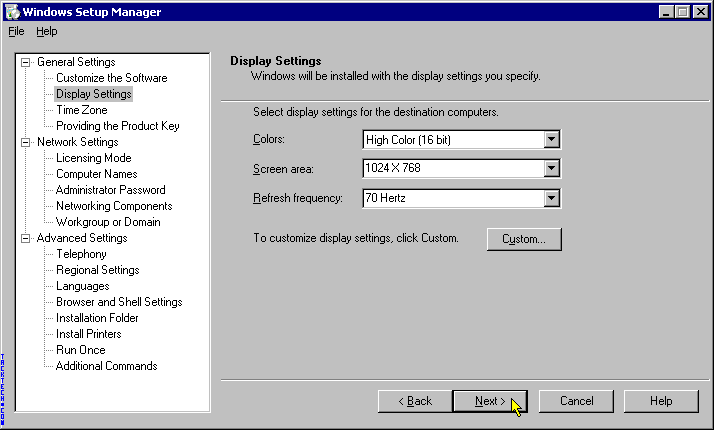 Choose the Colors / Screen Resolution / Refresh Rate for your monitor. Click Next. 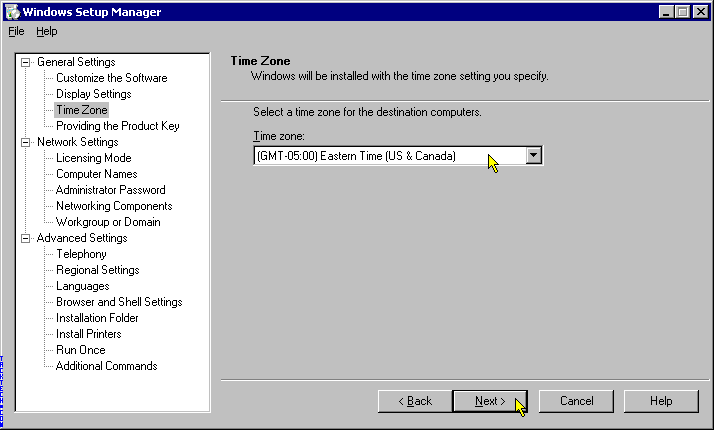 Select your Time Zone and click Next. 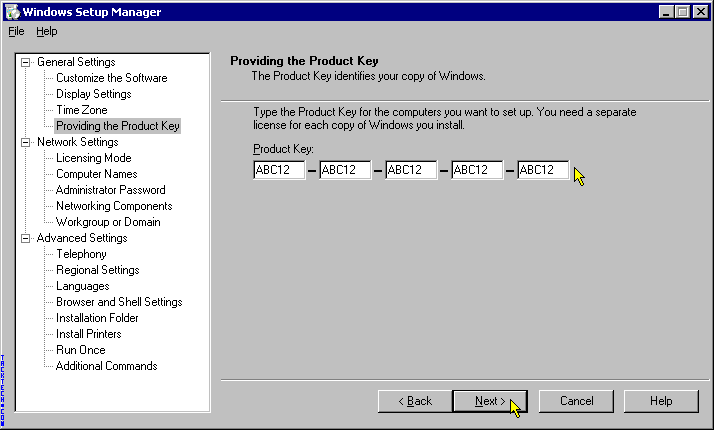 Enter your Product Key. Click Next. Note:Use your own Product Key. 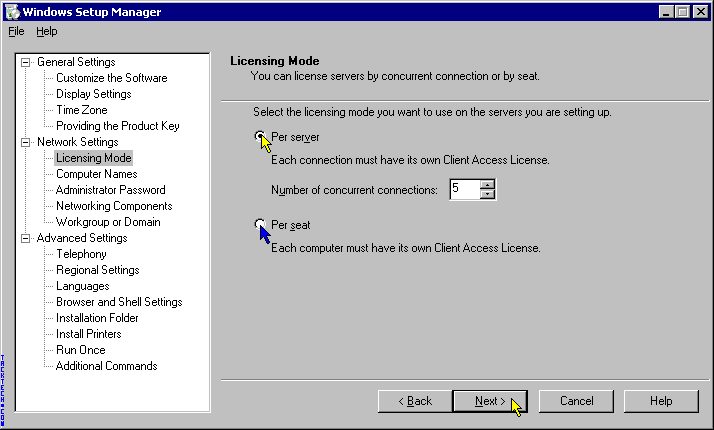 Select Per Server or Per Seat for Licensing Mode. Click Next. 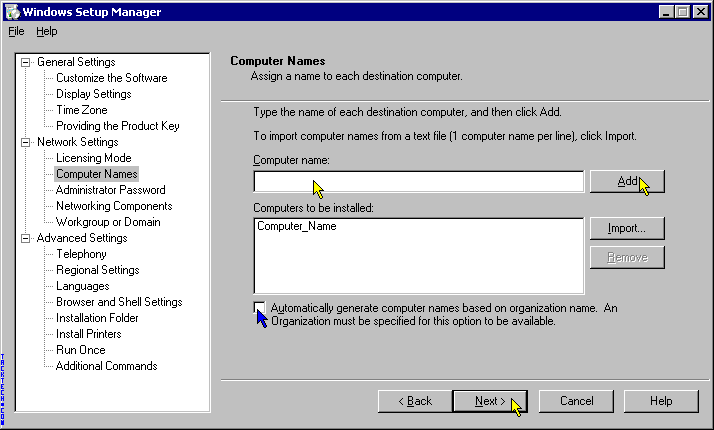 Enter a computer name. Click Add. Click Next. 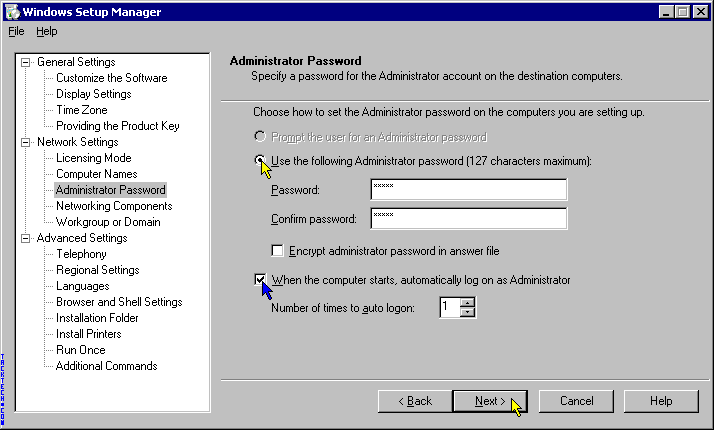 Enter and confirm an Administrator password. You can also tell the install to auto-logon the first time the computer starts up. Click Next.